There are so many varieties of the Crepe Myrtle that everyone needs to do a little research to find out which is the best choice for your personal needs. The Crepe Myrtle is a garden marvel and will be the envy of all who watch it develop as the seasons change. Myrtles, also referred to as Lagerstroemia, are known to be the longest blooming trees in existence. They are known for their extended periods of striking summer colors. This quality, combined with their magnificent fall foliage and drought resistance, has made the Crepe Myrtle, a favorite in both formal and informal landscapes in many areas of the country. Crepe Myrtles were introduced to the United States during the 18th century. Since then, extensive breeding of this plant has resulted in a wonderful assortment of varieties. This ranges from ground covers which are only two feet tall, to shrubs of all heights, to trees soaring almost forty feet tall. 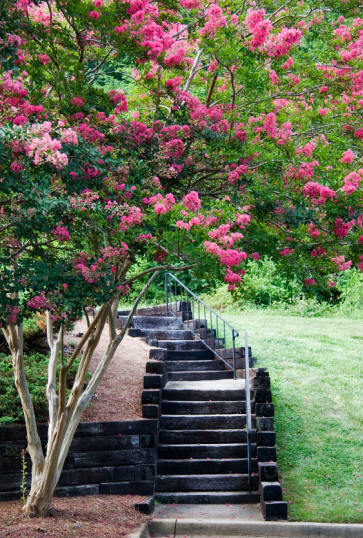 The dwarf varieties of Crepe Myrtles allow gardeners with small yards to also enjoy these beautiful plants. In the opinions of most horticulturists, the "Hopi" is the hardiest of all Myrtles. Since there are so many varieties of the Myrtle, it would be helpful to concentrate on a few of the most popular ones. As mentioned, the "Hopi" reaches just seven to ten feet tall and six feet wide. It can be grown as a small tree or merely a large shrub or it can be pruned easily to allow it to fit into smaller spaces. Another popular practice is that several can be grown together to form a hedge or easily grown in a container for the patio or porch area. Interesting to note, is that this miraculous specimen was developed by the National Arboretum in Washington, D.C. The different varieties of the Hopi is one of several Crepe Myrtles which have been given Native America Indian tribe names. The color and texture will bring such interest to your garden, not to mention its bloom of beautiful pink flowers. In the fall, the dark green foliage will turn to a reddish orange color that will be a striking addition to any winter garden. It is that versatile. If one is interested in a heavy blooming shrub, the Crepe Myrtle Little Chief Red is a must for any garden. It starts as a seed in the winter or early spring and by summer you will be overwhelmed by the unique bright rosy-red summer blossoms. Reaching two feet or more by its first year, this easy to cultivate bloom is nothing short of an amazing addition to any garden. You cannot go wrong with this choice. The newest of the Crepe Myrtle is the dynamite Crepe Myrtle. Not only will these blooms last at least 120 days, but you will be given some of the brightest red flowers of any tree you have seen. With its need for limited care, the dynamite is one of the hardiest trees on the market. They begin as a light red color and quickly get brighter with sunlight and age. When it eventually turns cherry red, each cluster gives off an explosion of flowers, plenty enough to even brighten your home in a vase where you can just enjoy its wonderful beauty and fragrance. Whatever your choice is for this years Crepe Myrtle, and only a few of the varieties have been mentioned here, you will not be disappointed. They have become so popular among real garden lovers, that they sell out very quickly. We suggest that you make your choice early, and do not delay placing an order. ENJOY!!!!! !